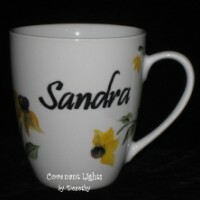 Coffee Mugs that can either have the design painted on both sides, or be personalized with the name of your special someone on the front. Just let me know your preference when you order. Have another design in mind? Contact me. 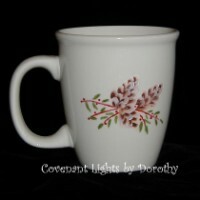 "The Hummingbird mug arrived, and it is lovely. The size is perfect, and I love the colors you chose for the bird and the roses. My fiance will be very happy with it when he gets it as a birthday gift next week! Thanks also for the prompt delivery!" "Thank you for the beautiful hand painted coffee carafe. Great work." All glassware & ceramics have been hand painted with enamel paint and then baked for permanence. Hand wash only, please. 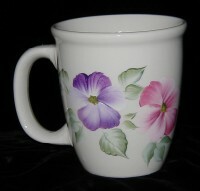 Coffee mug with hand painted pansies. PLEASE NOTE: Mug shape may vary from what's shown in photo, depending on availability. 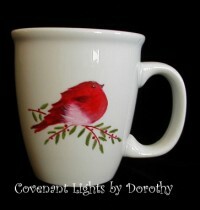 Coffee mug with cute little hand painted red bird. Personalized with name on the front, or pine cones on the back, your choice! 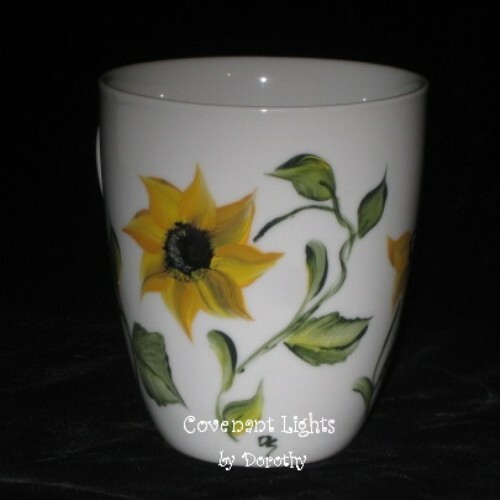 Coffee mug with hand painted sunflowers. Personalized with name on the front, or sunflowers on both sides, your choice!